This statistic shows the box office revenue of the top ten movies worldwide on the weekend ending April 14, 2019. 'Shazam!' was first in the worldwide rankings, having generated 61.04 million U.S. dollars in revenue worldwide in the presented weekend, whereas 'Dumbo' ranked second with box office revenues of 31.19 million. The degree of success of a film or the film industry is often measured in terms of box office revenue. Box office revenue refers to the number of people who buy a ticket and the amount of money those ticket sales raise. A forecast for the global box office revenue has been provided by PricewaterhouseCoopers for the years 2014 to 2018. 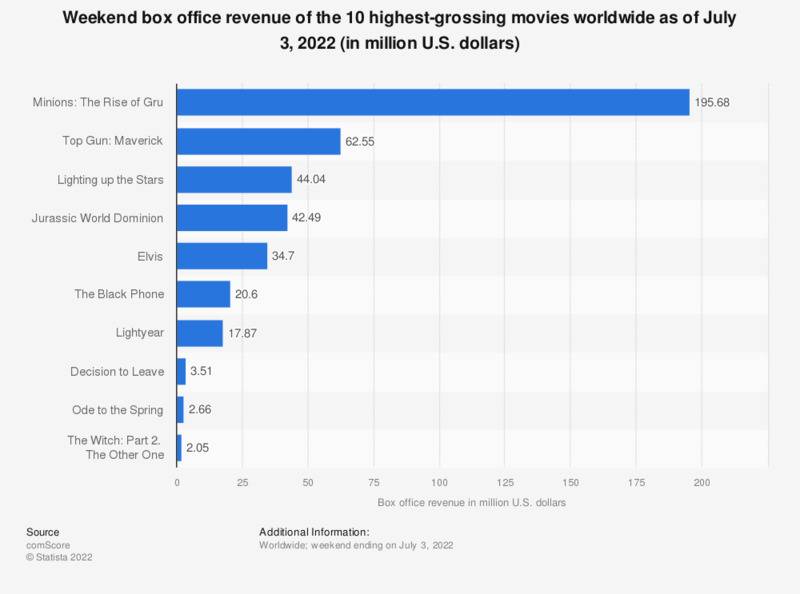 It is estimated that the worldwide box office revenue will reach 38 billion U.S. dollars in 2014 top nearly 46 billion U.S. dollars in 2018. When it comes to the box office revenue of the leading film studios worldwide, Warner dominated in both the United States and the rest of the world in 2013. Warner generated approximately 3.14 billion U.S. dollars from the international market and 1.89 billion U.S. dollars from the U.S. Warner’s cinematic releases in 2013 included high profile films including The Great Gatsby, Man of Steel and Gravity. The second most successful film studio at both the domestic and international box offices in 2013 was Disney with releases including Frozen, Oz the Great and Powerful and Iron Man 3. With titles such as Saving Private Ryan, Jaws and the Indiana Jones franchise under his belt, Steven Spielberg has achieved enormous success at the box office throughout his lengthy career. From 1975 to 2014, the production costs and global box office revenue of selected Steven Spielberg movies have been documented. In 1993, Jurassic Park cost 63 million U.S. dollars to make and it generated a global box office revenue of 1.03 billion U.S. dollars. Figures are estimates and have been rounded.